i've been hanging out more than is good for me on the vintage sewing blogs lately. i've always recognised the rather obvious appeal of fifties fashions, but the less showy delights of the thirties/forties are a whole new world for me, and there's nothing i like more than immersing myself in New Stuff. so that's how i came to be browsing etsy for 40s fabric and that's how this little beauty came into my life. from vintage pickle on etsy, i totally recommend this seller. 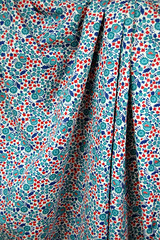 such a gorgeous crisp print, reminiscent of these "Perky cotton prints, perfect for sporty styles and shorter hemlines." from the 1939 montgomery ward catalog (fabrics.net). i won't be flashing it with this though, something demure and somewhat sensible i reckon, a classic forties pattern. it's a not-particularly-drapey cotton, so i'm not sure it will work with the gathered yoke dresses i've recently come to love. i have my eye on a princess seam dress that looks like the perfect balance of quirky period detail with a utility vibe that plays down the girliness of the print (i fear there's danger of straying into this kind of territory if i get carried away with the puffs and the ruffles!). i have to hold my breath a bit though, as i don't know if the seller will ship to me and it looks like i have competition, it's a cute pattern. also i can't find any yardage info for the pattern and looking at similar styles it may take more than i have. i have cunning plans though, and if i can't squeeze it all in i'll use contrast collar/cuffs/whatever. i read recently (i don't remember exactly where) that it was common for wartime patterns to include a mix of fabrics, so they could be assembled from what small lengths of fabric were available, often recycled from old garments.